DIY Motorized remote control skylight blinds and shades can be easily made with our ShadeSlider™ remote control skylight and bottom-up window shade kit for residential or commercial applications. Discover how easily it can be operated with our standard 8 channel hand held remotes, our standard RF wireless wall switches, and by phone, tablet or PC with our ZWAVE add-on. The Vera™ compatible digital radio controlled ShadeSlider™ sytem has a low power, very energy efficient 12v motor, and you can also order it with our built-in battery motors (with solar charging option). 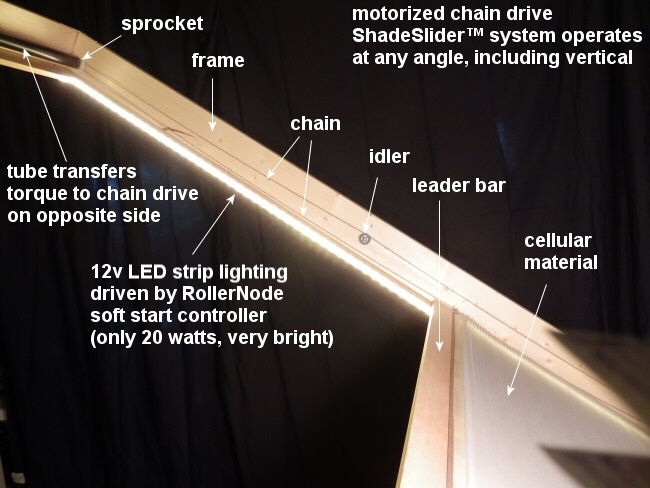 The unit shown in the video above is about 5' x 8', with optional soft start LED strip lighting installed on each side. It is a highly scalable solution, and the entire unit runs on 12 volts DC and can be solar and/or battery powered. It also comes with a 110/220 AC power supply, if you prefer. Ideal for use with cellular shade material, it can be adapted for many applications: skylights, bottom-up window shades, greenhouse shade systems, pergolas, sliding cupboard doors, etc. We also sell light filtering (translucent) and blackout cellular fabrics on our custom shade website. You can make our ShadeSlider™ kit product work for just about any size of window or skylight shade application; that was the whole idea behind it. The length of tubing you choose for the torque transfer tube determines the width, and the chain determines the length. You can use 1 1/4" EMT steel conduit that works well for the tubing (and ABS or PVC). In the pictures below, we used ABS plumbing pipe, but we found that it is acoustically resonant (noisier); we think that EMT is the better choice. Although it is harder to cut and drill, it is extremely strong and quiet. Please note that we now supply the special tubing for the motor. Cellular shade material comes in various forms: translucent, blackout (cells are silvered internally). You attach one end to the frame with staples and/or tape, and make a leader bar for the traveling end (we used a 1x2). The cellular fabric is stretched across the opening, forming a rigid membrane. When it retracts, it collapses in accordion-like fashion to a very small size. For control you can use our radio motor version, which can be extended to work from your phone, PC or tablet. Or you could go to a minimalist wall switch configuration, with a non-radio motor (which also has an interface to connect with other home automation systems). The width and height of the structure can be anything you like, within reason, until you exceed the lift capacity of the motor. The motors run on 12v, but there is also a battery type option that is completely wireless (with solar charging option too). Basically, you can think of this as two 'clotheslines' with 'pulleys' on either side of the skylight, window or whatever it is you want to cover (for the purpose of this discussion, we'll refer to it as a skylight shade). But instead of pulleys, we use sprockets, and instead of clothesline wire, we use chain. 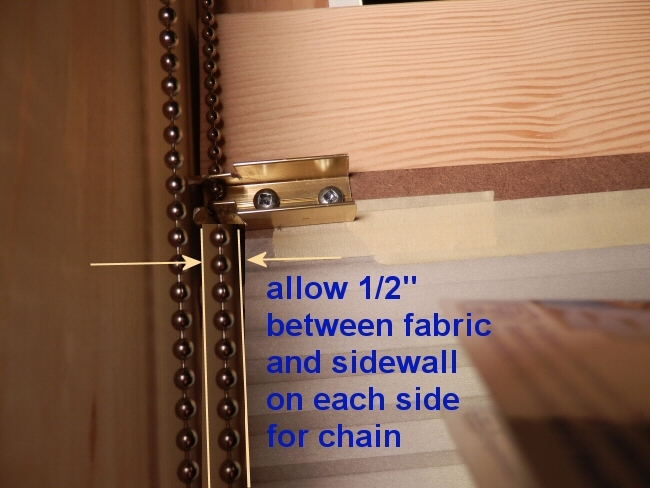 So there is zero slippage, without a requirement for any particular tension. 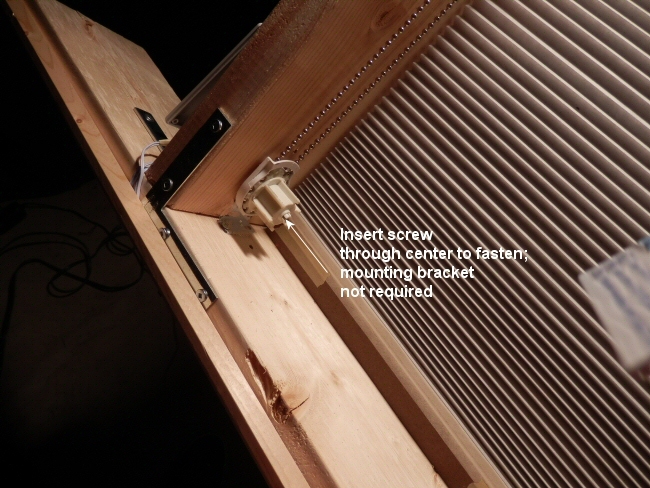 The main parts of the system are located at each end of the skylight, with a chain (instead of clothesline) running from one end to the other, on both sides for an even pull. At one end, a tube that is the width of the skylight has sprockets (instead of pulleys) inserted in each end. 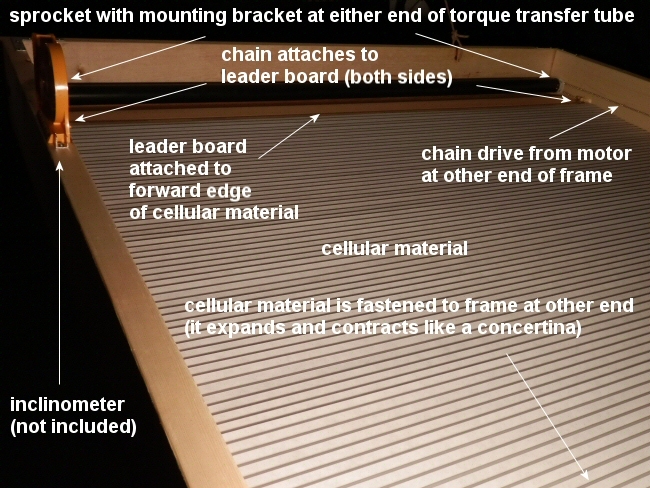 This torque transfer tube connects the sprockets (pulleys) together so that the chains (clotheslines) on either side move in unison. At the other end of the skylight, one side has a drive sprocket attached to a motor, which applies power to operate the entire system. The other side has an idler sprocket to complete the chain loop. 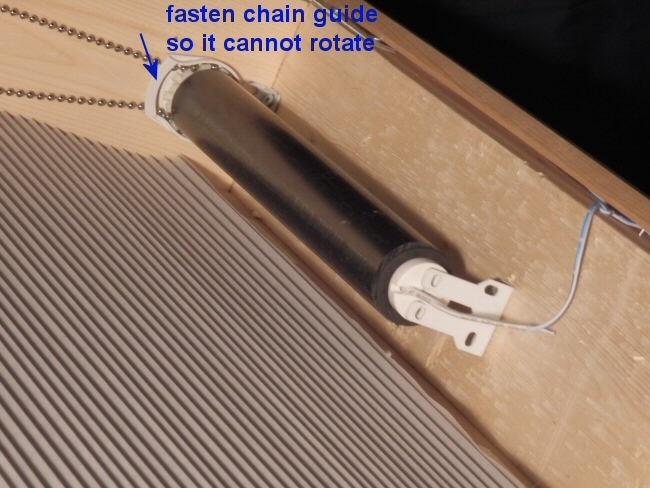 This is not an infinite loop system - the point where the chain joins is the point of attachment for the leader bar that drags the entire shade forward or backward. You can use U channel or some other type of fastening to connect to the leaderboard. 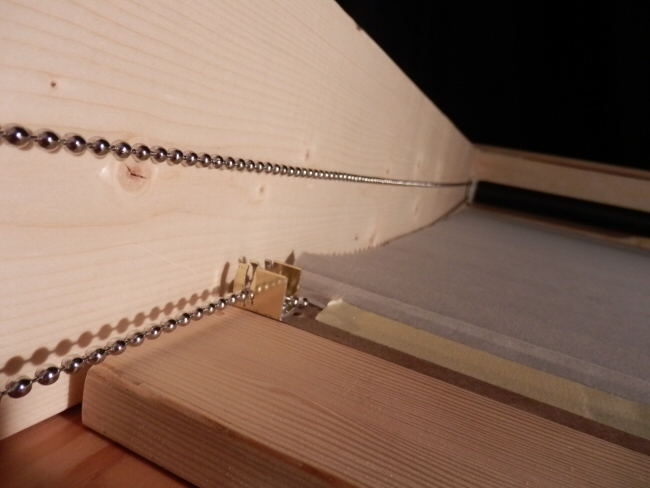 The pictures show stainless steel chain being used, but metal chain is expensive, noisy and not necessary. Now we use nylon bead chain; it is affordable, lightweight, very strong and much quieter. The LED strip lighting is completely optional; we just wanted to show how it creates a nice effect.